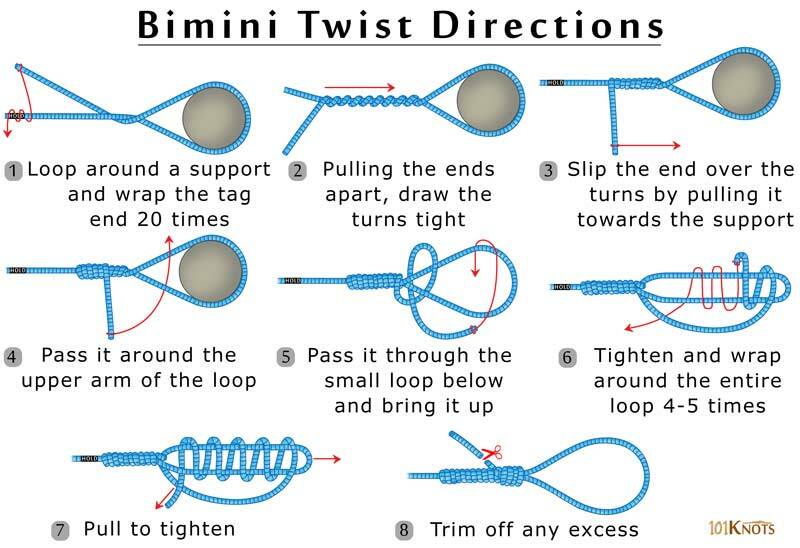 The Bimini twist fishing knot retains almost the entire strength of the line to which it is tied. Hence it is known as a 100% knot. Resulting in a loop at the end of a line that can later be used for loop to loop connections, it can successfully be used to make a double line leader. Keep a long tag end while forming the initial loop. It is important to cinch the initial twists to prevent the knot from slipping. As the twists start tightening, moisten the knot for increased effectiveness. While doing steps 3-7 you should maintain pressure at both the ends of the loop. 20-30 twists are ok for a nylon mono while 60 or more should do for Spectra-type braids. Give a neat finish with a half hitch around both the legs instead of one followed by a 6-turn reverse uni pulled up very tight. You can also try out the Rizzuto finish (a type of whipped finish). After creating the double line with the knot, you can nicely connect it to a swivel or a wind-on leader with a Cat’s paw. An FG knot is a slim but powerful option to connect the double line to the leader. Though it seems complicated at first and some people find it better to use a tying device, after sufficient practice the method is quick and easy. 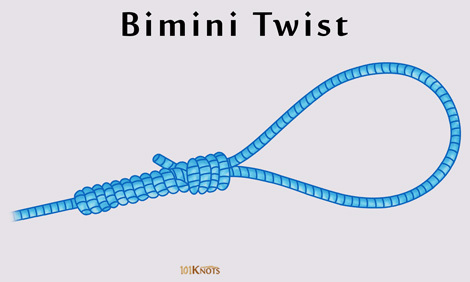 Double Bimini twist – The line is doubled before tying a Bimini twist creating 2 loops instead of one. Good for joining gel spun backing to fly line. One of the best knots to join backing to the fly line using a loop to loop connection. In big game fishing, sport fishing the ulua. Strongly joins a snap swivel or barrel. Helpful to create the double line in a Yucatan knot. Forms a part of the GT knot for combining mono to braid. Suitable for attaching a wind-on leader and completing tarpon leaders of maximum tippet strength. Securely unites a shock leader with the running line. When combined with the no name or Bristol knot forms a fine light-tackle line-to-leader connection significant for free-lining baits, casting and occasional jigging. Plus, its smoothness prevents real baits from flying off the hook while casting. In contrast, the surgeon’s and Albright knots are better for uniting the main line to a heavier leader. The Aussie quickie, a good braid to fluorocarbon knot is tied with the Bimini twist on the braided line. However, the double uni, relevant for the same purpose, can do without it. Here’s a great video guide to tie the knot in just 30 seconds! Dropper loop – A moderately strong knot that makes additional attachments in your fishing line possible. Perfection loop – Creates a small loop at the tip of a leader or tippet that is completely in a straight line with the standing part.